Peter Gould was born in Portsmouth in 1952 and studied piano and cello before going to the Royal Academy of Music in London, where, after only ten lessons, he passed his A.R.C.O. and changed to organ. He became organist of St Margaret’s Church in Putney as a student and then went to Bretton Hall College in Yorkshire for a postgraduate teaching year. Whilst at Bretton he became involved in playing the organ for Keith Rhodes at Bradford Cathedral. His links there helped to prepare him for the post of Assistant Organist at Wakefield Cathedral which he took up in 1976 under Jonathan Bielby. This he combined with full-time teaching at Honley High School in Huddersfield. 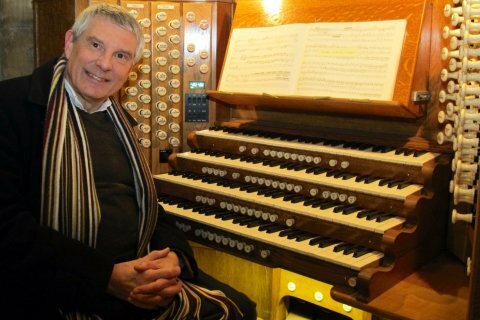 He was awarded the Attridge Trophy in the National Organ Competition in Southport for his playing of Bach in 1977 and in 1983 he took up his present appointment in Derby Cathedral. At Derby he lost no time in re-appointing boys to the Cathedral Choir and in 1997 he established a Girls’ Choir. The choirs have toured both nationally and internationally since then and made several recordings and appeared on radio and television. In 2009 Derby University awarded Peter an honorary degree in recognition of his twenty-five years as Cathedral organist. In May 2014 he was made a Fellow of the Society of Church Musicians. He was involved in directing the music for the Queen’s Royal Maundy visit to Derby and regularly broadcasts on BBC radios 3 & 4. He will be retiring from his post as Master of the Music in Derby Cathedral in January 2015 having done 32 years there, with a total of 40 years ministry in English cathedrals. Peter is an examiner for the Associated Board and has undertaken many foreign examining tours including one last June/July to Malaysia. Over the past 38 years he has taught in many junior and secondary schools including Derby Grammar School and Derby High School. He is an accompanist to the Derby Bach Choir. He was made a lay canon of Derby Cathedral in May 2012. He has given organ recitals in Belgium, Germany, New Zealand and many English cathedrals and major churches including Westminster Cathedral, Westminster Abbey and King’s College, Cambridge. Town Hall appearances include Huddersfield and Birmingham. He has recently performed in Coventry and St Pauls’ Cathedrals. He is currently finishing an organ pilgrimage around the whole diocese of Derby aiming to play every organ (270 of them!) in two years. He has collected over £6,000 for musical charities as a result. After 32 years at Derby Cathedral he announced his retirement in 2015.